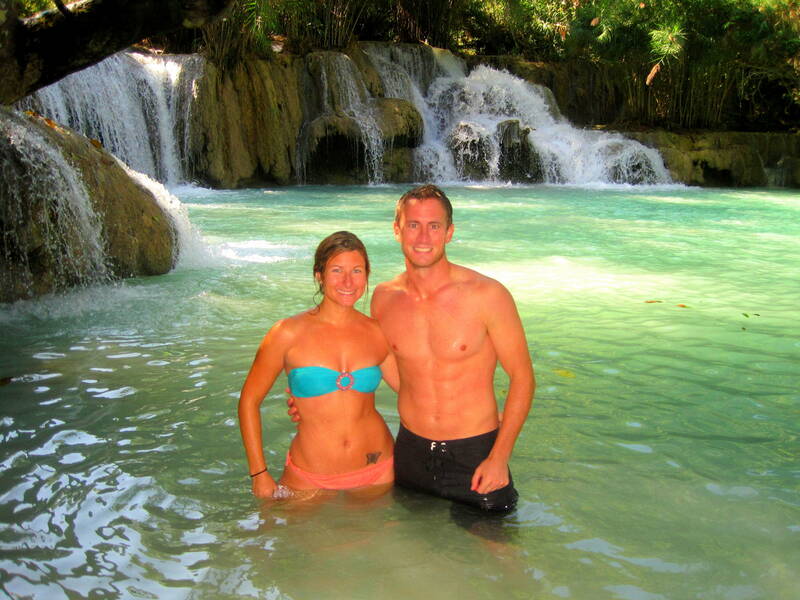 She says: The trip to Laos was definitely an experience. It started with the worst van ride EVER! John and I have been on some pretty windy, curvy roads throughout our travels, but nothing like this. I am pretty sure I felt sick within the first 20 mins of our 5 hr ride. I swore I was going to have to request the driver to pull over a couple of times. My saving grace was the 7/11 we stopped at for a potty break. Thankfully they had motion sickness pills. THANK GOD! They allowed me to endure the last 3 hrs or so. Around 245am we arrived at a rather drab hotel where we were to sleep until about 630am. Surprisingly J and I got our own room. We both slept with our clothes on as this hotel was about as nice as the $29 mistake we stayed at in Miami, FL. Bright and early the next morning we were picked up and stuffed into a little pick up truck and taken to breakfast. After breakfast we had a series of immigration stops before we arrived to our slow boat. I don’t mind the red tape so much, it was the picking up and dropping off of our packs about 15 times that really started to annoy me. We were told by our travel guide that we would arrive at the boat early so we could get the good seats. Nope didn’t happen. Our group was the last to arrive and didn’t even have seats! Fortunately we bought pillows to sit on and we think ended up better than the seats. 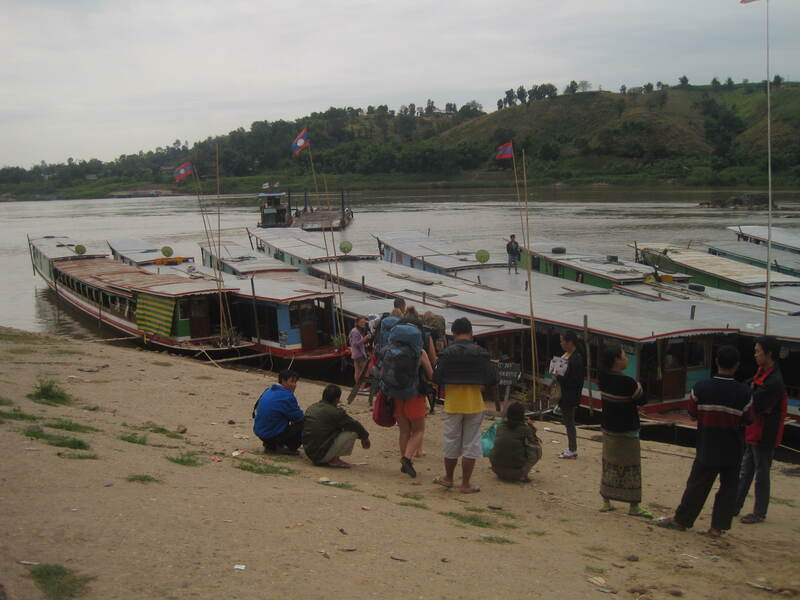 We had the entire back of the boat where we could stretch out or stand and enjoy the scenery of the mighty Mekong River. And the rest of our group.. The local kids watching us float by. 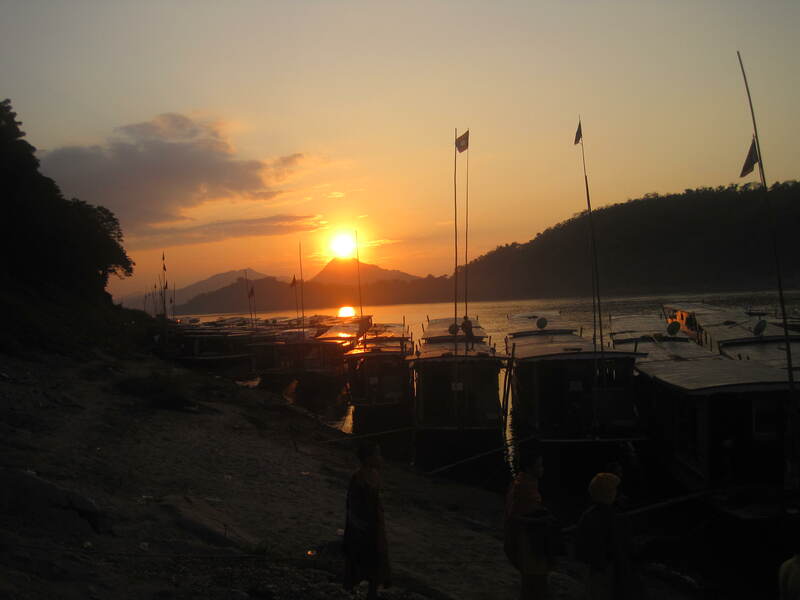 Arriving to Luang Prabang in time for the sunset. We arrived to our destination right around sunset. 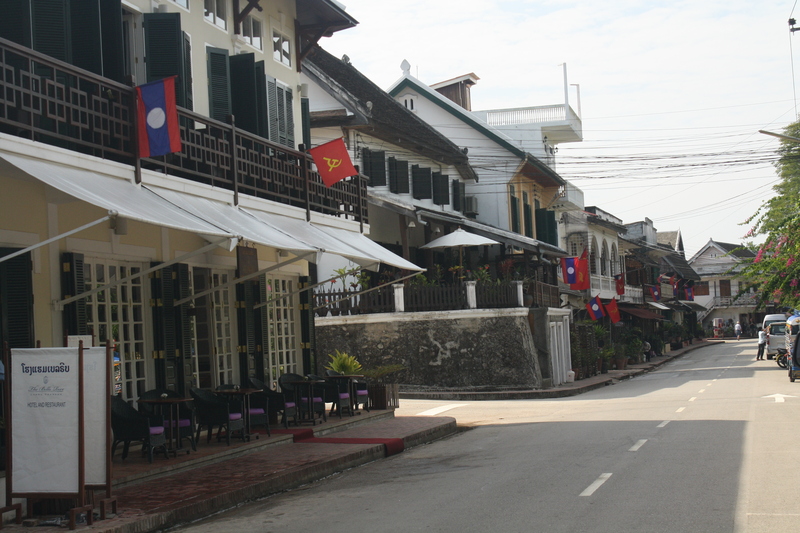 Luang Prabang was a nice surprise. Since LP was once a French colony much of the town had an old colonial look to it. There was a lot of French architecture as well as French cuisine. The best part was the baguettes found on the side of the road everywhere and the delicious coffee! Who knew they would have great coffee in the middle of Laos!? 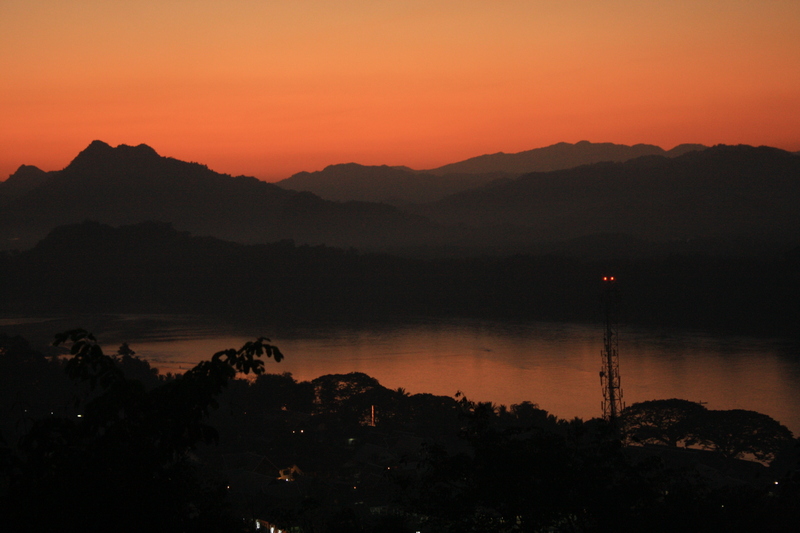 Enjoying the sunset from the highest point in LP. The big temple in LP. The night market they set up every night on the main road in LP. 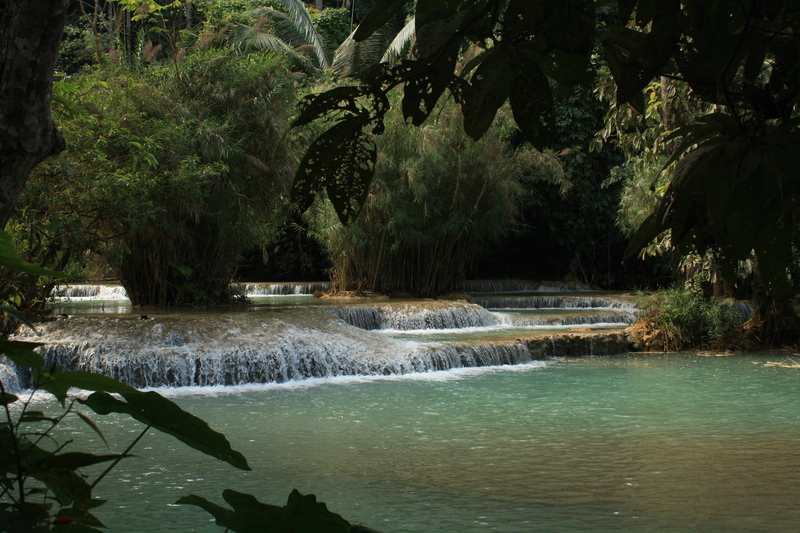 The best part of LP for me was Kuang Si Falls. 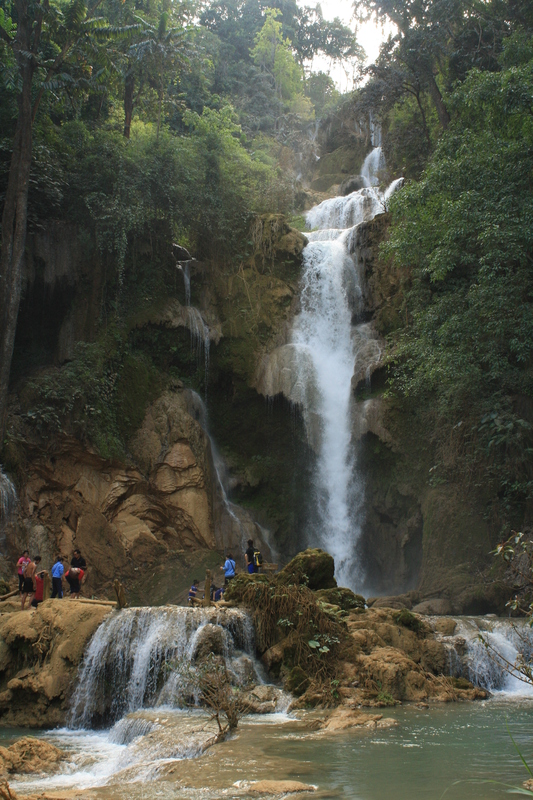 These waterfalls were located about 20km from the city and were gorgeous! I had never seen anything like them. 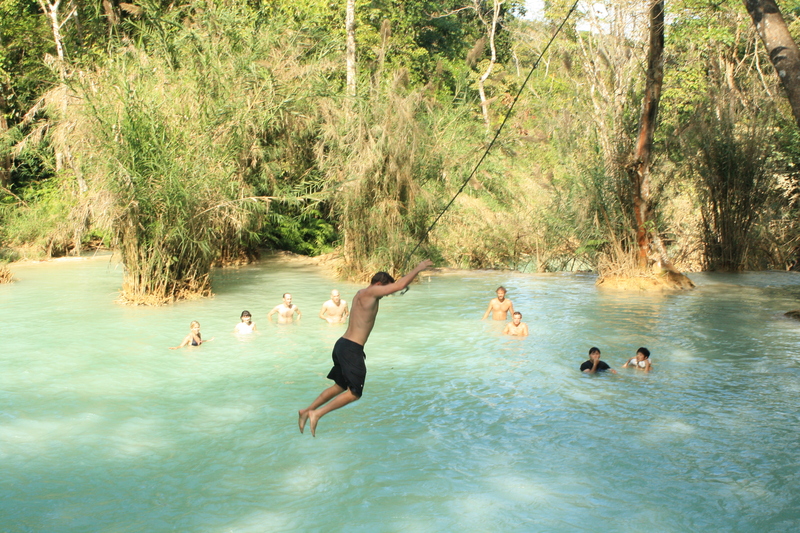 The best part was a rope you could swing and jump from into a lagoon you could swim in. I told J that a place like this was on my bucket list. I had always wanted to find a hidden oasis where waterfalls landed into a beautifully colored lagoon that you could swim in. This place was exactly as I had imagined, maybe even better! It was completely out of a movie. Just a few of the tiers. Another fun thing we did while there was Yoga! I was pretty nervous. For those of you who know me, I don’t do yoga.. I have tried, but failed haha. I feel as though I am too anxious of a person. It makes me anxious to just sit on the floor and breathe and listen to others around me breathe. J and I really want to do a Yoga retreat in India so I figured I should have a trial run first. The first 10 mins were a bit difficult, however, once we got started I calmed down and pretty much forgot about the anxious feeling. Before I knew it the hour was already over. It got me really excited for the retreat! I definitely have work to do — but at least now I know I can do it. 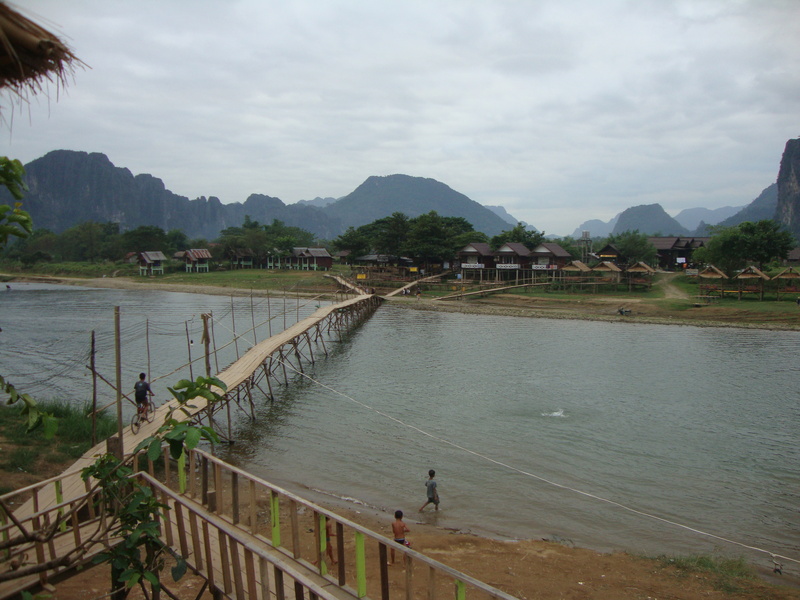 After Luang Prabang we headed to Vang Vieng. This is a very laid back hippie town that is better known for its tubing. Since J really enjoyed the trip down and participated more fully in the tubing scene 😉 … I will leave this part of the trip to him. He Says: Being a coffee and bread lover, LP was a dream come true. Throw in the Buddhist temples and monks mixed in with French colonial architecture and you get a truly unique experience. At one point it was considered the “Pearl of Asia”. I think there’s a few SE Asian cities who claim that distinction but LP had ’em beat. 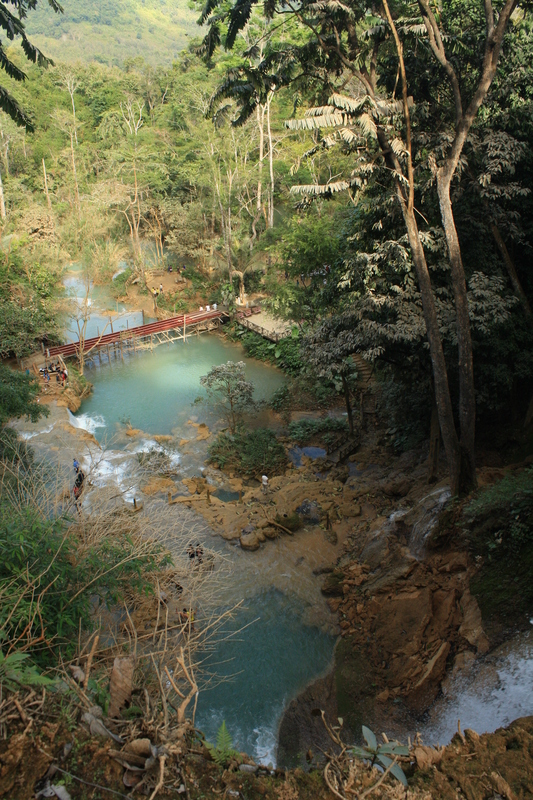 Obviously, the Kuang Si waterfalls were the highlight of our time there. It’s always great to check something off your bucket list so we were glad that TB got to. Because it was such a cool experience I’ve decided after the fact to add it to and check it off my list. 🙂 There’s plenty of places in the world where you can swing off a rope into water, but the tiered waterfalls and opaque turquoise lagoons made Kuang Si truly special. 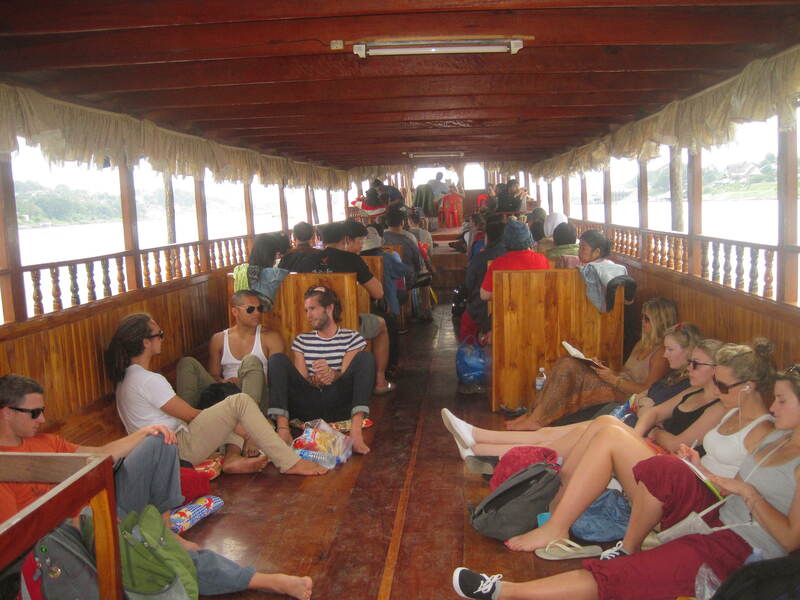 After LP we took another bumpy, curvy bus ride to Vang Vieng. I have to say I don’t agree with TB’s description of VV as a laid back hippie town. 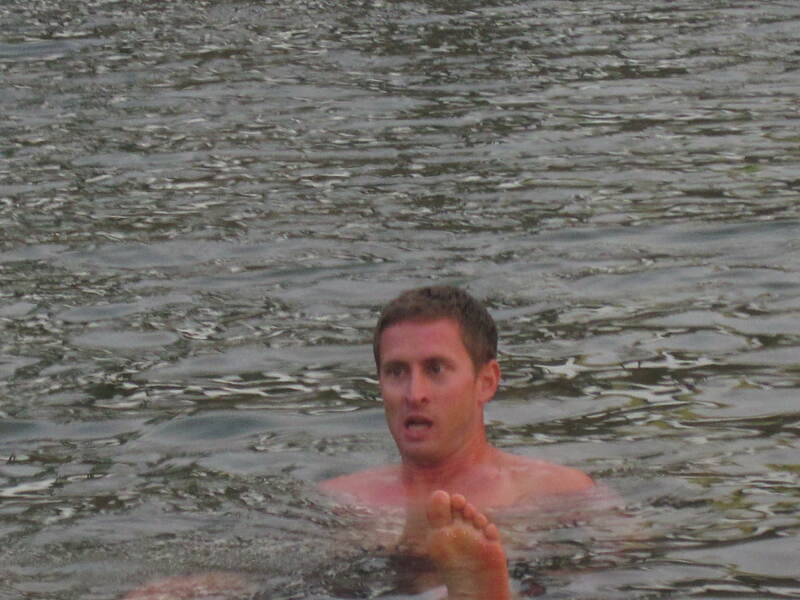 It was more akin to a Spring Break party place, but instead of beaches there were rivers surrounded by huge cliffs. The only hippie thing about it was the scent of weed floating around every corner. If you read a description of VV in any travel guide you’d find that “tubing” is the major attraction. The travel guide will explain that tubing is where you leisurely float down a shallow river that has bars situated on either side. 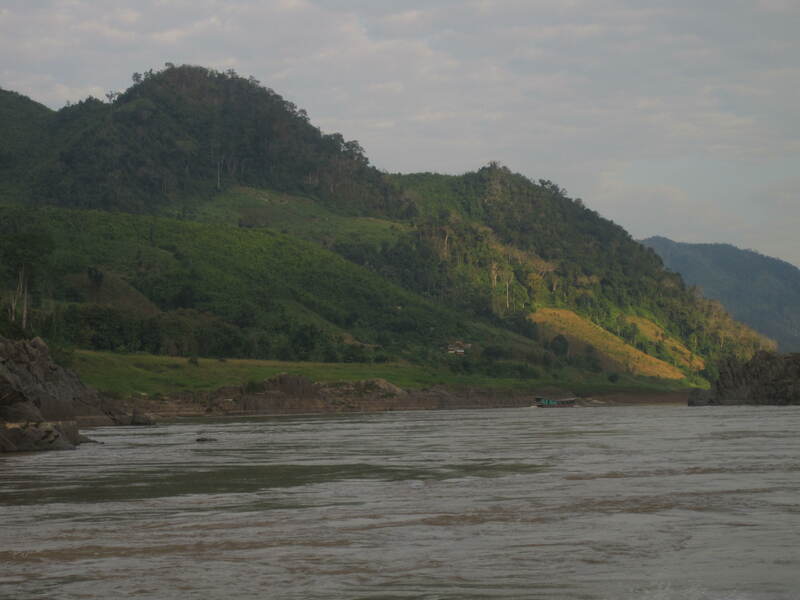 As you float through you stop at each bar and drink plenty of Beerlao and the local version of whiskey…and so the ride ends up being not so leisurely. 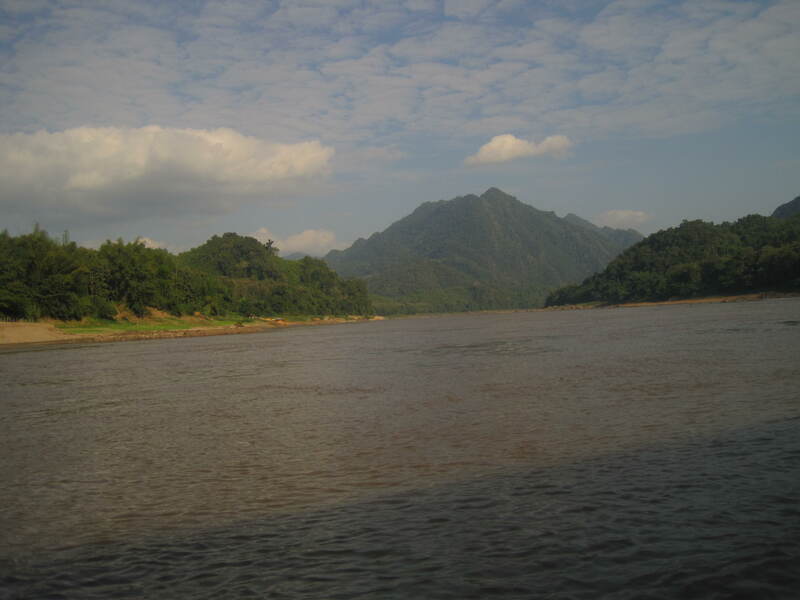 If you continue reading, the travel guide will then warn you that each year at least a few careless travelers are killed from drinking too much and drowning in the river. 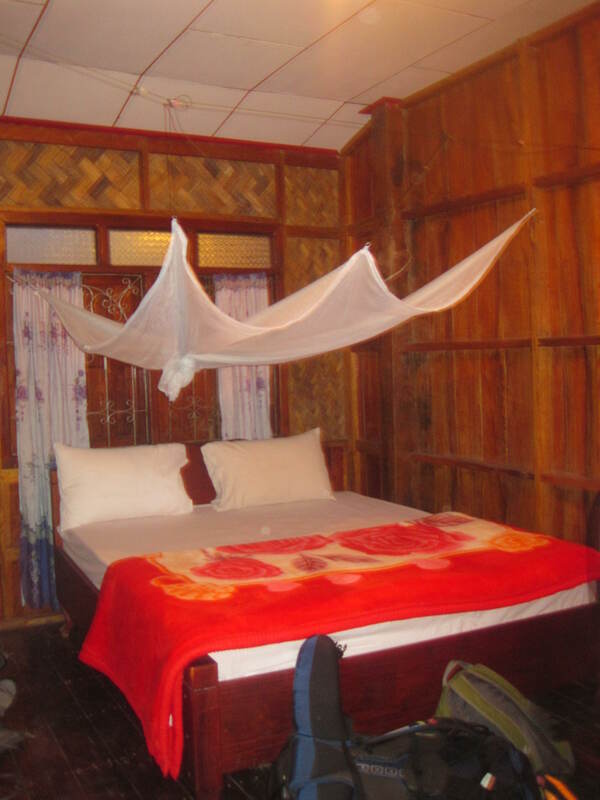 Go to Youtube and search for Vang Vieng, you’ll understand why. Having read the bleak descriptions in the travel guides and seeing the videos on Youtube, TB and I had to make VV one of our stops. Contrary to what a lot of people judge from our photos, we’re really not party animals. 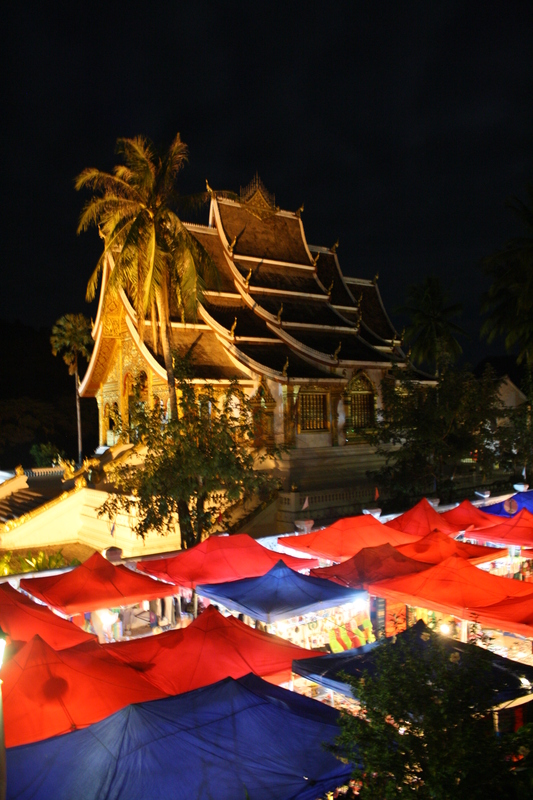 Having said that, we couldn’t go to Laos and miss out on the festivities. We got more of an idea of what to expect when, on our bus from LP, we met an English couple who’d been working in VV for the last 3 months. They’d gone to LP for a 3 day vacation, but even after 3 days they still looked hungover and their bodies were covered with scrapes and bruises. In fact, most of the people we saw in VV were covered in scrapes and bruises or were walking around on crutches. Seeing this, we figured one night of debauchery would be all the time we could handle in VV. The day we chose to go tubing ended up being cool and cloudy so getting in the water didn’t sound appealing. Luckily, we could still partake in the festivities without actually getting in the river. 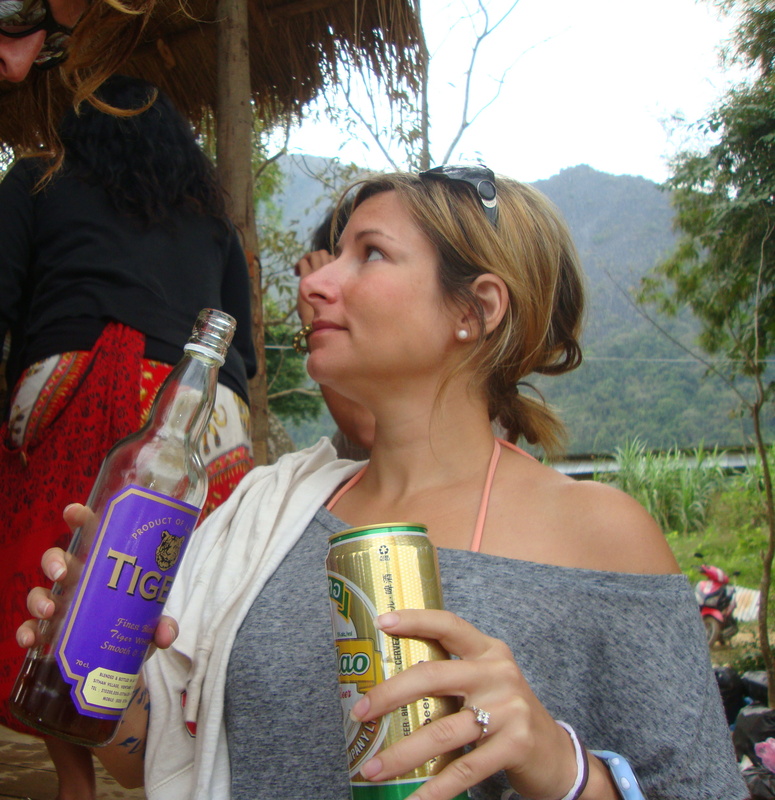 Our tuk-tuk dropped us off across the river from the bars and we were immediately greeted with a free shot of Tiger whiskey. TB passed on hers but of course I couldn’t let it go to waste. We crossed the river and, upon reaching the first bar, were greeted with another shot of whiskey. This time I was able to encourage TB to handle hers. The club music was bumping loud enough to drown out your thoughts and dozens of drunk 20-somethings were dancing around, jumping in the water and throwing their buckets of whiskey on each other. TB and I lounged on the dance platform for a bit while the revelers danced, stumbled and tripped all around us. We met a Frenchmen who chatted us up for a while in his thick accent. TB and I both agreed we couldn’t understand a word he was saying, but nodding as he talked seemed to entertain him. He gave us his bucket of whiskey so we assume whatever he was saying was nice. Next, we met an Irishman who used the word “bro” as much as a high school girl says “like”. Other than “bro” we couldn’t understand what he was saying either. TB got stuck talking politics with a Canadian who happened to be a Communist and didn’t approve of American materialism (I was glad I got stuck with the Irishman). TB also got to meet the Teenage Mutant Ninja Turtles so that brightened her mood. We saw the English couple we met on the bus from LP but didn’t talk to them because they were hard at work (dancing, passing out shots of whiskey, writing profanity on people in permanent ink and collecting a whole new set of scrapes and bruises). At some point we played beer pong and lost, most likely due to 4 years of accumulating rust. 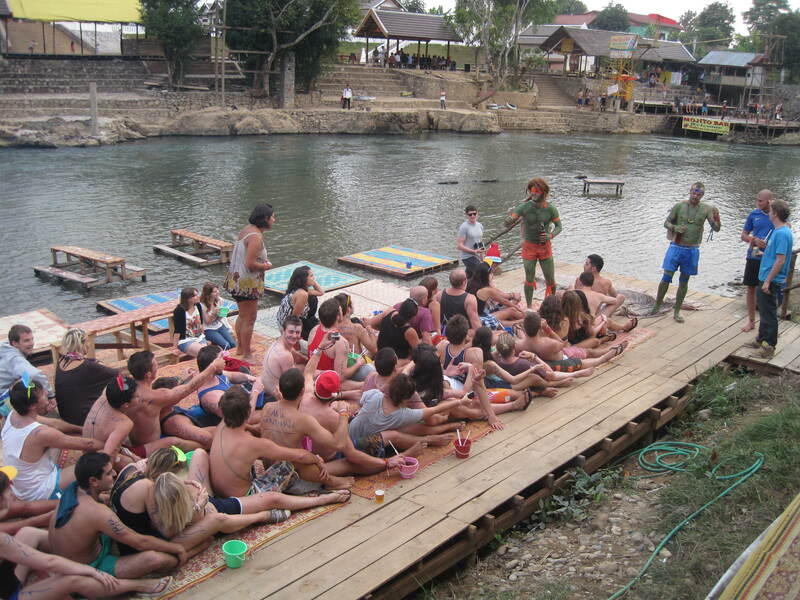 We then headed to the next bar down the river to repeat all of the above with new people. 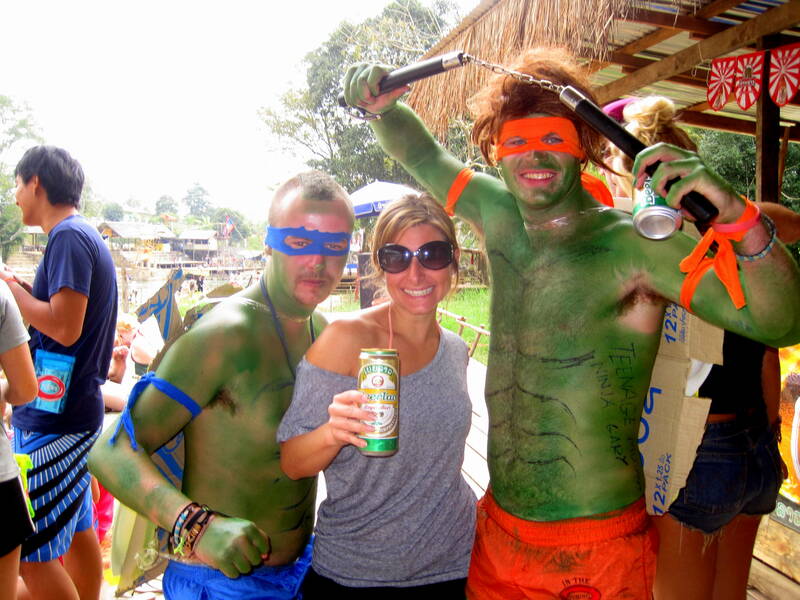 I got to meet the TMNT!! And this is what they call a whiskey train.. Choo Choo! J rolling in the river. This pretty much sums up the day! Like I said, one night of debauchery was enough for us. We woke up bright and early the next morning for our next bus ride to Vientiane. Not surprisingly, my head felt like my brains had been bashed out by a brick wrapped in a lemon. Getting stuck in the back of a hot bus driving over potholes for almost 5 hours was Karma reminding me why I don’t like to party like that anymore. 🙂 TB found the bus ride amusing…or maybe her smile came from watching me suffer. 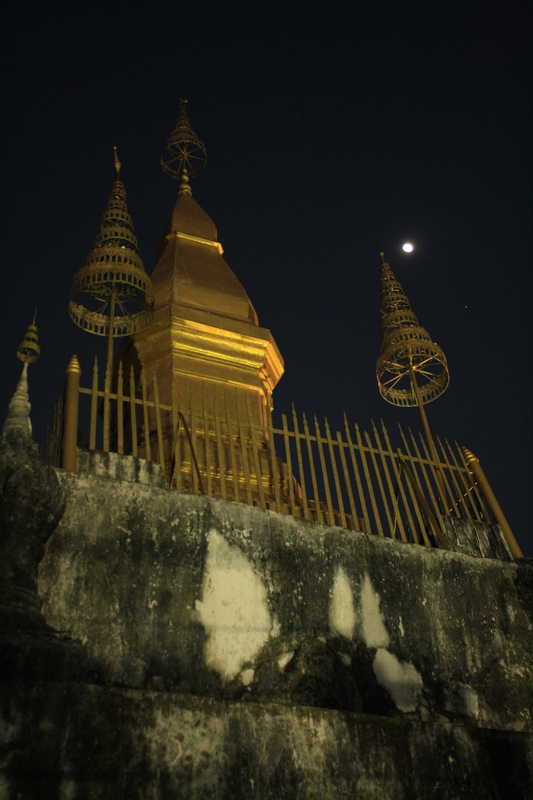 Nothing too exciting to report on Vientiane. 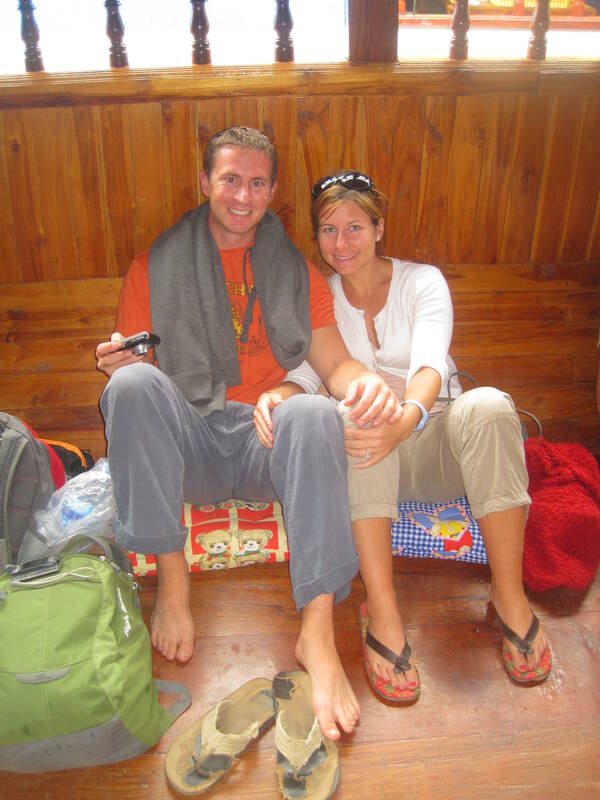 Unfortunately, we were stranded there for 7 days waiting for our Indian visas to be processed. We definitely would’ve preferred to spend that week elsewhere. It’s a usual city with nothing particularly interesting. We spent half a day riding around on bicycles seeing the sights and the other 6.5 surfing the net in coffee shops. Other than good Americano there was no reason to stay there after our visas were finished. 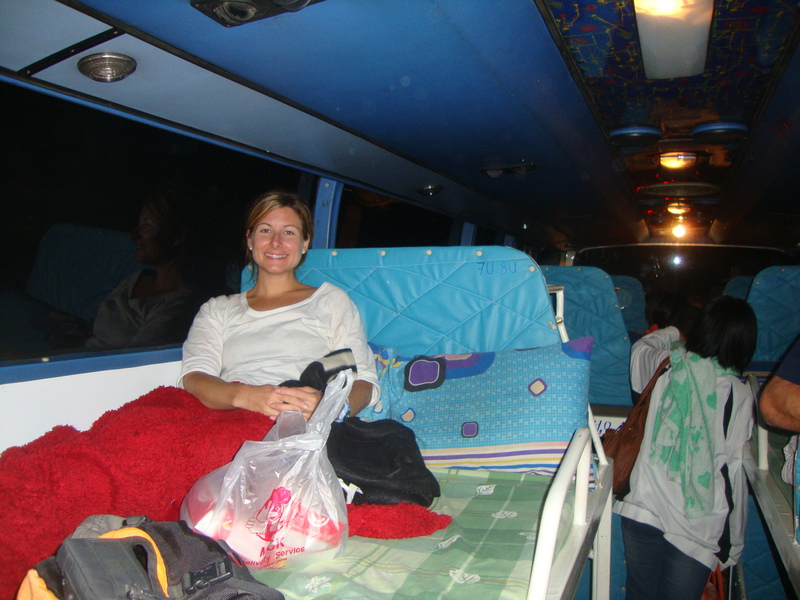 The evening they were completed we high-tailed it out of Vientiane to Siem Reap, Cambodia on a sleeper bus. This was probably the best bus ride we’ve had to date. It literally had bunk beds stacked on each side of it. Although we didn’t actually sleep much because of the potholes, the ride was at least more comfortable because we weren’t crammed in seats. After about 12 hours we made it to the border, went through the standard red tape and crossed into Cambodia safe and sound. 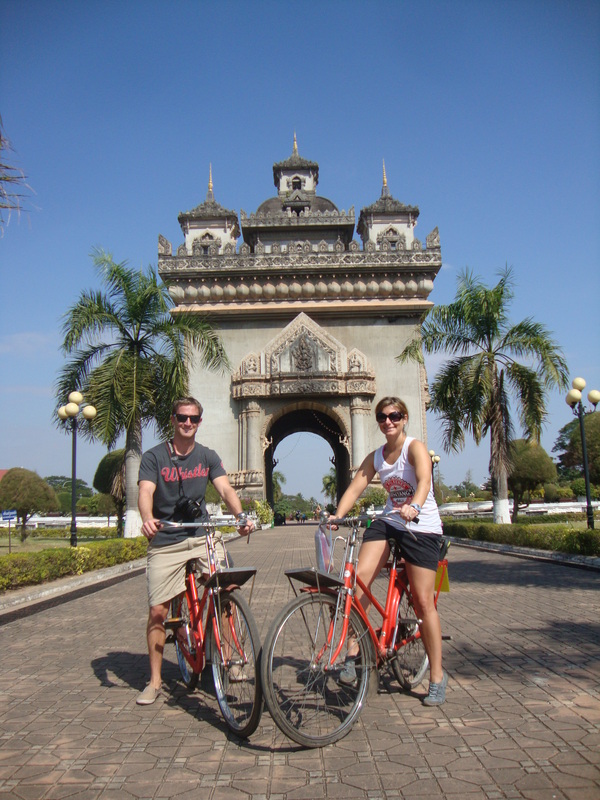 The most exciting part of our time in Vientiane...other than the coffee. Hi J & T, Happy New Year. You guys are sure having a great time. Don’t know if you’ve seen this but this is John Schollum’s daughter ‘Miss Whangamata 2012″.